Beach Pad! Cross the road to the beach! Property 9: Beach Pad! Cross the road to the beach! Property 19: The Family Retreat . Whangamata Estuary hideaway close to the beach and estuary. Wi-Fi and heat pump. 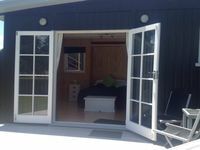 Property 20: Whangamata Estuary hideaway close to the beach and estuary. Wi-Fi and heat pump. Property 36: Beverley Tce bach, tropical, funky and spacious. What a great find! An absolute little gem.Normally when coming to Beach Hop we have to bunk down in shared accommodation but this was so so much better.Self contained,private,great parking,central,beautifully appointed,comfy bed and so clean.So nice to have a modern bathroom all to yourself and a well equipped kitchen.Great views across the golf course,just couldn't fault really it.So ideal for BH. Had everything you needed for a comfortable holiday.The only thing missing was a toilet roll holder.Bit of a mystery that one. 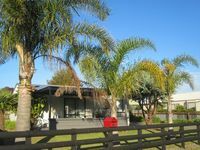 Sandra, even though away during our stay, provided detailed instructions and we were well looked after..Definitely would come again and we totally recommend this property..